BEIJING, Nov. 1,Chinese Premier Li Keqiang on Thursday called on China and the United States to manage and solve differences via consultation. 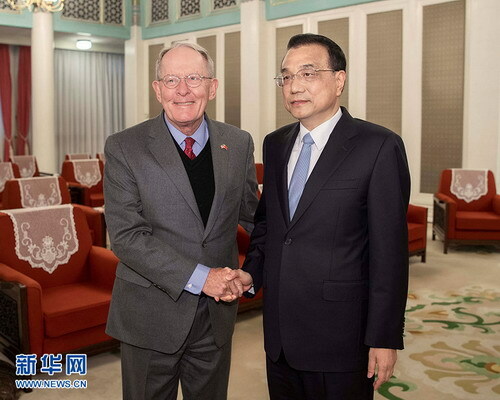 Li's remarks came as he met with a seven-member delegation of U.S. senators and congressmen led by Senator Lamar Alexander in Beijing. China and the U.S. are the biggest developing country and the biggest developed country in the world respectively, and are at different stages of economic development, said Li. The economies of both countries are highly complementary, and both people benefit from the bilateral cooperation, he said, adding that various problems may occur in the economic and trade cooperation. "Both sides need to respect each other and give consideration to each other's core interests and major concerns and manage and solve differences via dialogue and consultation on an equal footing," Li told the delegation. "This not only benefits our two countries but also benefits the whole world," he said. "Although China and U.S. relations have had their share of ups and downs, generally speaking, they have moved forward in the past four decades," Li said. Facts show that the sound and stable growth of bilateral relations serves the fundamental interests of the people from China and the U.S., he said. The two countries need to follow the important consensus reached by the two presidents during their meetings and work together to move China-U.S. ties forward on a sound track, said Li. He expressed the hope that U.S. senators and congressmen could play a constructive role to the end. Stressing that China will firmly deepen its reform and further open up to the world, Li said China's development will provide more opportunities and a broader market for other countries. For his part, Alexander told Li that their visit to China is to "show respect to a great country and great people." The U.S. and China "are competitors but not adversaries," he said. "We believe with mutual respect we can continue to prosper together." The U.S. senators and congressmen present at the meeting agreed that there are far more common interests between the two countries than disputes, adding that both countries need to treat problems in the economic and trade area through fair and equal consultations while initiating a trade war is not a way to solve problems. They voiced the willingness to promote U.S.-China relations and boost mutual understanding and cooperation. The two sides also exchanged views on bilateral, regional and international issues of common concern.